« A Concert on the Upton Farmlands? The Upton Farm Preservation Network is now in a consultation process with representatives of the province, the City of Charlottetown and the Canada Lands Corporation to develop a plan to preserve the Upton Farm Lands as greenspace. 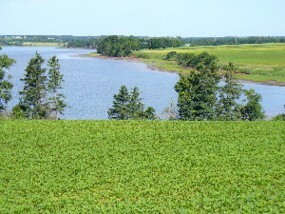 The UFPN was informed in early February 2008 of the City of Charlottetown’s desire to hold a concert on that portion of the Upton Farmlands located on the north side of the TransCanada Hwy. It was impressed on the UFPN that the City was in consultations with concert promoters and that a portion on the north side of the Upton Farmlands had been identified as a prime outdoor concert location, given its topography, which formed a natural amphitheatre. The City of Charlottetown asked the UFPN for its opinion on the matter. The UFPN working group took a neutral position. A meeting was held the last week of February, with representatives of the City of Charlottetown, the province, CLC and the UFPN in attendance. The UFPN was asked to clarify its stand on the concert. The concern of the UFPN is, and always has been, the long-term preservation of the Upton Farm Lands as greenspace. The UFPN has been assured by all parties, that, if a concert is held on the Upton Farm Lands, that the property will be restored to its pre-concert condition; that this is a one-time event; and that no other concerts or events will be staged on the Upton Farm Lands until the consultation process referred to in the first paragraph is completed. Given these assurances, the UFPN will NOT OPPOSE a ONE-TIME-ONLY use of the property as a concert venue while consultations are on-going. The UFPN wishes to make it clear that it has been given guarantees by all parties involved that this decision will in no way impact the larger consultation process to keep the Upton Farm Lands as greenspace. This entry was posted on March 6, 2008 at 8:49 pm and is filed under Raising Awareness. You can follow any responses to this entry through the RSS 2.0 feed. You can leave a response, or trackback from your own site.